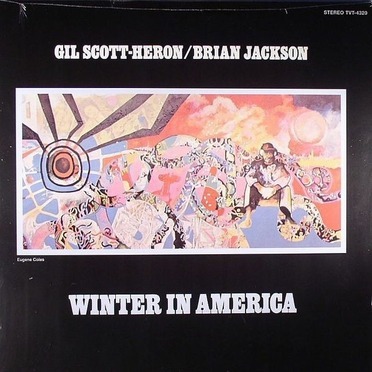 Winter in America is a studio album by American recording artist Gil Scott-Heron and musician Brian Jackson, released in May 1974 on Strata-East Records. Recording sessions for the album took place during September to October 1973 at D Sound Studio in Silver Spring, Maryland. It contains introspective and socially conscious lyrics by Scott-Heron that reflect on African-American culture at the time of the album's conception. While Jackson's piano-based arrangements are rooted in jazz and the blues, their stripped-down production for the album resulted in a reliance on more traditional African and R sounds. The album serves as Scott-Heron's and Jackson's debut release for Strata-East Records, following a dispute with their former label and departure. It proved to be their sole release for the independent jazz label. Upon its release, Winter in America featured limited distribution in the United States and quickly became rare in print. However, with promotional help from its only single "The Bottle", it obtained considerably larger commercial success than Scott-Heron's and Jackson's previous work.